The sciatic nerve runs through the piriformis muscle in the buttocks region. 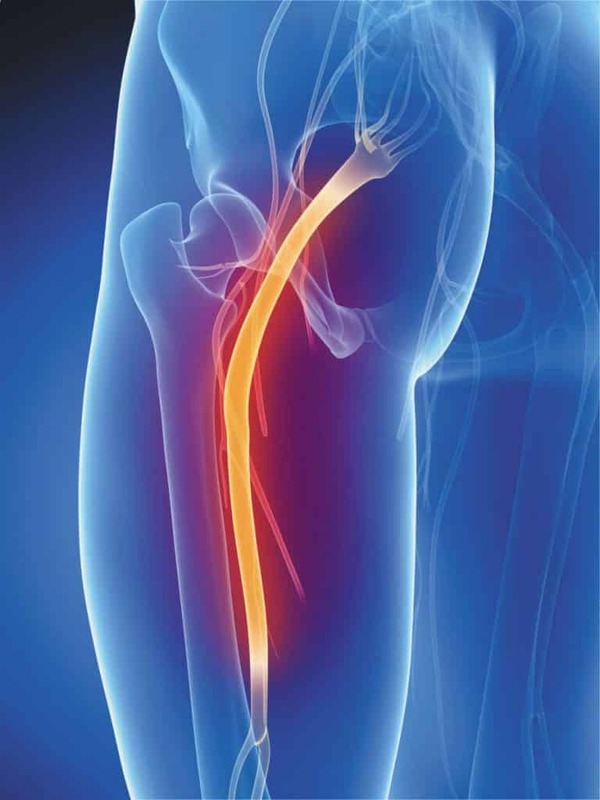 When the muscle shortens or spasms due to trauma, it can compress the sciatic nerve. This cause of sciatic symptoms is piriformis syndrome, a major cause of sciatica. So the approach to treating Sciatica is to reduce the compression forces that cause the pressure upon the sciatic nerve. This can be accomplished through traction and realignment therapeutic procedures. Manual muscle stretching, massage, and mobilization techniques should be used. This will help especially when the sciatica is piriformis muscle-related. General therapeutic goals include helping the muscles loosen. Therefore we can lessen the pain and minimize inflammation. The pain is felt in the lower back, buttock, and/or various parts of the leg and foot. In addition to pain, there may be numbness, muscular weakness, and difficulty in moving or controlling the leg. The symptoms are usually only on one side of the body. Sometimes it can be on both. So a proper exam is crucial. Sciatica is a relatively common form of low back pain and leg pain. Sciatica is a set of symptoms rather than a diagnosis for what is irritating the root of the nerve, causing the pain. This point is important. Because treatment for sciatica or sciatic symptoms often will be different. So it will depend upon the underlying cause of the symptoms. Compression of a lumbar spine nerve root L4 or L5 causes sciatica. It is accompanied with an inflammatory response. This is from a spinal disc herniation (a herniated intervertebral disc in the spine), or from roughening, enlarging, and/or misaligning of the vertebrae (spondylolisthesis), or degenerated discs. This can be painful. It’s also extremely tiring. Pregnancy can be another cause. Primarily resulting from the uterus pressing on the sciatic nerve. And, secondarily, from the muscular tension and / or vertebral compression consequent to carrying the extra weight of the fetus. And the postural changes inherent to pregnancy. “Pseudo-sciatica” causes symptoms similar to spinal nerve root compression. Compression of peripheral sections of the nerve causes this. Usually this is from soft tissue tension in the piriformis or related muscles. One possible cause of this is the piriformis syndrome. In this condition, the piriformis muscle, located beneath the gluteal muscles, contracts spasmodically. Therefore it strangles the sciatic nerve beneath the muscle. Another cause of sciatic symptoms is sacroiliac joint dysfunction. Unhealthy postural habits can cause sciatica. Some of these are excessive time sitting in chairs. Or insufficient stretching and exercise of the relevant myofascial areas. Therefore it can lead to both the vertebral and soft tissue problems associated with sciatica. Yet another source of sciatic symptoms is active trigger points of the lower back and the gluteus muscles. In this case, the referred pain is not, in fact, consequent to compression of the sciatic nerve. Although the pain distribution down the buttocks and leg is similar. Trigger points occur when muscles become ischemic. This means they have low blood flow. This is due to injury or chronic muscular contraction. The most commonly associated muscles with trigger points triggering sciatic symptoms are: the quadratus lumborum, the gluteus medius, the gluteus minimus, and the deep hip rotators. One cause of sciatica is a spinal disc herniation, pressing on one of the sciatic nerve roots. Your discs are made of cartilage. This cartilage has a liquid center. The discs are what separate the bones in your spine. Therefore they allow room for the nerve roots to properly exit through the spaces between the L4, L5, and sacral vertebrae. The discs cushion the spine from compression forces. But they are weak to pressure applied during rotational movements. That is why a person who bends to one side, at a bad angle, to pick up a piece of paper may more likely herniate a spinal disc than a person falling from a ladder and landing on his or her back. Herniation of a disc occurs when the liquid center of the disc bulges outwards. That causes tearing the external ring of fibers. Therefore it compresses a nerve root against the lamina or pedicle of a vertebra, thus causing sciatica. Other compressive spinal causes include Spinal Canal Stenosis. This is a condition where the spinal canal (the spaces through which the spinal cord runs) narrows. And that compresses the spinal cord. Bone spurs, vertebral dislocation, or herniated discs can cause this narrowing. These decrease available space for the spinal cord. Thus pinching nerves in the spinal cord that travel to the sciatic nerve. Therefore irritating them with friction.